If there’s an enzyme that regulates concern for how one is perceived by the general public, my levels are dangerously low. Add that to my tendency to choose a logical (to me) solution despite the hair-pulling, eye-bulging frustration of my companions, and I’m pretty sure I’m a sociopath. As evidence, I present Exhibit A: my fanny pack. But I don’t wear it on my fanny, so I refer to it as a waist pouch. See? Blatant disregard for the norms of society. I’m not actually oblivious to fashion; I just find it annoyingly illogical. On those rare occasions when I’m forced to dress up, I wear stylish clothes and hide my waist pouch inside a capacious handbag. But it’s only an empty gesture to craftily hide my psychosis (which is another earmark of sociopathy, by the way). When I’m wearing my waist pouch, I’m happy and comfortable… and a walking fashion faux pas. I’m fully aware the fashion police will one day take me down. But until they do, I’m keeping it. It’s comfortable, practical, and hands-free. It’s attached to my body, so it’s impossible to accidentally leave it behind. When I’m riding a motorcycle, I don’t have to figure out how to carry a purse. When I’m hiking or skiing or golfing, it’s right there when I need it. And despite its approximately five-pound weight, it’s effortless to carry because it hangs on my hips, not my shoulder. As long as I’ve got my pouch, I’m set to survive anything from a business meeting to an exile in the wilderness. I’ve got bandaids, tissues, sunscreen, two kinds of lip balm (one with SPF 15), sunglasses, a flashlight, a bottle opener, one sturdy folding knife, and one Swiss-Army-type pocketknife with tweezers and screwdrivers and so forth. There’s a small drugstore’s worth of useful pharmaceuticals like ASA, ibuprofen, anti-nauseants, antacids, cough drops, zinc lozenges, dextrose tablets, eye drops, and a bronchodilator. And I have my smartphone, pen, earplugs, dental floss, concealer, hair brush, hair elastics, hand sanitizer, breath mints, scissors, a measuring tape, screwdrivers, reading glasses, nail clippers, and a nail file. Of course, I also carry my wallet, cheque book, and change purse. And a key to every lock in my life (21 in all, plus an extra for my car just in case). And a bunch of business cards. And two USB flash drives because I’m paranoid about keeping offsite backups of my work. Oh, and a little chunk of amethyst, because folklore says it enhances creativity and prevents drunkenness, which are both important considerations for a writer. And there’s still room for my MP3 player in a pinch. Everything has a place, and it’s packed so efficiently and predictably that I can find any item one-handed in the dark in ten seconds or less. How can you argue with those benefits? A waist pouch is clearly the best solution. It’s simple logic. Like all good sociopaths, I hold the implicit belief that I’m right and the rest of the world is wrong. So if you see the fashion police headed my way, call me. I’ll cut through the window screen with my pocketknife, lower myself on a rope made of dental floss, and cleverly disable their car with my screwdrivers before making my getaway. Wearing my sunglasses as a disguise. Why yes, actually, paranoia is also a symptom of sociopathy… why do you ask? I’m surprised you can get that much stuff in! I never can get that much in my hand bag, although, most of the space is normally taken by my kindle and a rather large book. (I’m a bookaholic, I can go anywhere without a book or the intention to buy a new one!) Although, I can normally fit money and my phone, as well as a few odds and ends such as a penknife, tissues and a pen. My Mum seems to have everything but the kitchen sink in her handbag. Glad to know it is not just her! Hmmm… I’m amazed that you can get all that stuff in there! I still lug around a big old shoulder bad that I can never find anything in. I keep telling myself it’s time to find one of those “Old Lady” purses. (Sorry – don’t mean to offend anyone, but I don’t know what else to call them. My grandmother had one.) They used to be advertised in infomercials and had about 10,000 pockets and compartments in them. But every time I think I might break down and buy one… I realize that at the moment I’m still vain enough to worry about having to pull out my glasses to read a tag, label, menu, restroom sign… etc, adding the Granny Grab bag to the mix is just too much to take all at once! Anyway… I’m off to find me some amethyst… who knew?? I don’t know much about fashion, but you could survive for months in the wilderness with what’s in that thing. Wonderful, but after reading your books, none of us *really* believe there isn’t a gun in there. You can deny it all you like, but your fans know! Good sensible move, going with the colostomy bag look. Added benefit is no one ever tries to steal it. “prevents drunkenness” … and that helps how? I admire you, but until my iPad can fit in one of those, I will have to stick with my purse. Yes, that’s the only drawback. My Kindle doesn’t fit. Maybe I’ll make a cool shoulder holster for it… you know, like one of those concealed holsters that go under your arm. I’m thinking that would be badass: “Fastest Kindle in the West”! not a sociopath, my dear lady. just practical. if you want to take the fashion police heat off? hang out with a guy wearing sandals with socks. the belt bag will go unnoticed! Being English, Diane, my first reaction to the phrase fanny pack is to cringe. That said, I could never fit anything into my fanny pack, so I must have been wearing it wrongly… it served just to carry loose change and keys in the end, and I only used it when wearing shorts without pockets. Such a waste. If I’d have known I could have packed a suitcase worth of stuff, I’d have persevered! I’m very impressed with your packing! Yes, I’ve been laughing over my unintentional vulgarity. If I’d known about the “fanny” reference in advance, I’m sure I could have come up with a suitably cringe-worthy double entendre. When it comes to sociopathic sexiness, you can’t argue with Diane from Calgary, or Felly from Technotronic. That’s my new motto. Fashion is only now, but style is timeless. Right on! I’ll just keep telling myself that. Batman can now retire his utility belt as an archaic relic of the past. I’m going to rush out and buy myself a fanny pack now so I too may blatantly wear it in open defiance to all that is normal. Only it may not mesh with my paranoid non-conformist rebel look when I park my moped at the biker bar. You have a Harley??? I feel so un-cool. If I put playing cards between my spokes and make really loud sputtering noises when I pedal, it almost sounds like a Harley! No, I ride a Honda – Harleys are out of my price range. But the playing cards are a great idea. You know what they say – “Loud pipes save lives”! 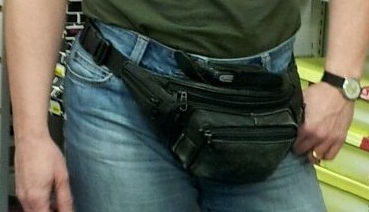 I’m no ‘Easy Rider’ but my fanny pack worn recklessly backwards projects my James Dean persona. Since I can’t have ‘loud pipes’ I have resorted to eating large quantities of beans before hoping on my moped; I backfire frequently before changing lanes. Drivers respect my space. Did I just resort to a desperate ‘poot’ joke in a lame attemot at humor? Yes. Yes, you did. Nicely done! You are badass, my friend. For owning the fanny/waist pack, and for riding a motorcycle, and for carrying enough stuff to be able to build a small bomb. If you were to buy a Leatherman multi-tool or Swiss army knifefor you pack, you could eliminate several items and leaving room for a flask of good scotch (medicinal) or perhaps a small firearm..
Diane, you and I have almost the exact same content in our fanny packs…lol. Except my knife is a brass knuckle “swiss army” type of knife, with few accessories that swing out. I tell my wife that if we ever need to abandon our house from a zombie invasion, we just need to grab two things, our home server and my fanny pack! If you are like me, you are probably looking for that “ULTIMATE” fanny pack. Please let me know if you find one that is completely waterproof and is able to sustain an adult person above water during water emergency…lol. Awsome post! Oooh, inflatable air bags! And it should come with a spool of zipline and a little grappling hook, too. I’ll get right to work on that. We sociopaths have to stick together. Great post. Thanks for a good laugh! Those would be very packed meetings, indeed. Never Say Spy is actually going to be re-released in a few weeks with a new cover and some minor revisions, so I’ll send you a free copy of the updated version when it’s ready. Guess what??? In some parts of the English-speaking world you are actually carrying your waist pouch on your Fanny! Hah. LOL! I hope that doesn’t mean I’m a conformist. That would totally spoil my badass self-image. LOL, I knew somebody was going to get you with this comment. You really need to refer the U.S fanny pack as a “bumbag” for some of our foreign pals, because they will laugh out loud if you are a woman wearing a fanny pack…lol. You seriously fit all that stuff in a fanny pack? Are you neglecting to mention that you’re 12 feet tall and that your fanny pack is actually the size of a body-sized duffle bag? I’m in awe.